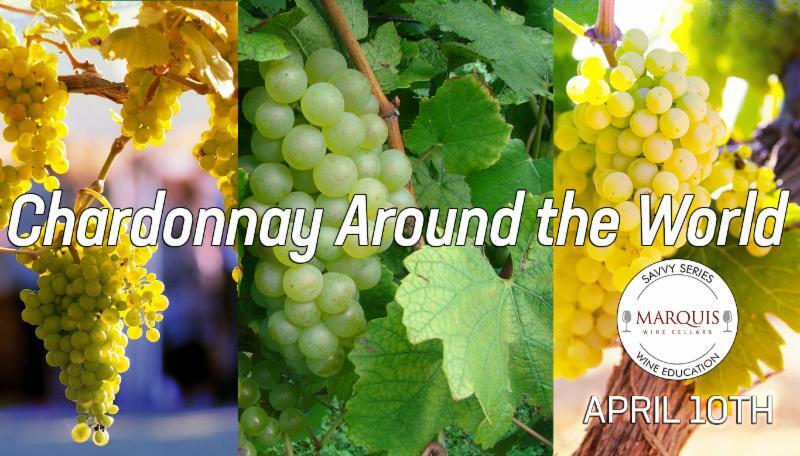 Savvy Series: Chardonnay Around the World & more! Final call for Vina Cobos tasting tickets! Chardonnay, one of the most adaptable grape varieties when it comes to the winemaker’s dream. A deft hand can demonstrate the magic of oak + grape, though an equally deft hand can create stars in a bottle, with no oak treatment at all. Chardonnay can be both a shape-shifter and the epitome of place and climate. Join our Sommelier, Pam Cohen, in an exploration of 6 different expressions of Chardonnay from around the world! NOTE: We cannot offer refunds or exchanges for event tickets. If you don't need your ticket anymore, kindly email events @ marquis-wines.com to be added to the waitlist. Please do likewise if you are searching for a ticket and the event is sold out. Join us tonight at Marquis Wine Cellars as we welcome Michelle Schromm, Global Brand Ambassador for Paul Hobbs & Vina Cobos. Viña Cobos is the inspired vision of Paul Hobbs, a pioneer who began exploring vineyard sites in Mendoza nearly 30 years ago. His founding aspiration: to produce a Malbec of power and elegance unequalled anywhere in the world. The winery’s full range: Cobos, Bramare, Cocodrilo and Felino, explores different vineyard sites within Mendoza’s premier growing areas while garnering exceptional reviews and admiration from press and the trade. Cost: $10.00 per person (purchase here) - if you cannot attend, refunds will be issued as store credit. Marquis Wine Cellars would like to thank Authentic Wine & Spirits for the chance to host this amazing event. (60% new French oak) Deep bright-rimmed ruby. Intense cherry and red berry scents, along with hints of cracked pepper, pipe tobacco and vanilla. Juicy and focused on the palate, offering concentrated red currant, bitter cherry and spicecake flavors that deepen slowly and turn sweeter on the back half. Fine-grained tannins build on a long, spice-laced finish that leaves behind a suggestion of cherry compote. In the context of top-notch California Cabernets, this wine delivers remarkable value. Very deep garnet-purple in color, the 2014 Cabernet Sauvignon, composed of 80% Cabernet Sauvignon, 16% Merlot and 4% Malbec, is scented of red currants, blackberries and wild blueberries with touches of olives and underbrush. Medium-bodied, tightly wound and packed with tense red and black fruits, it has a fine-grained texture and savory finish. 9,600 cases were produced. Bright aromas of Rainier cherry, cranberry and pomegranate, backed by great acidity and loaded with flavors of high-toned red fruit. Spring is in the air and this week we are pleased to offer the Côte Lavande Sauvignon Blanc. Last week we featured the Pinot Noir and it was a hit! Transport yourself to the iconic beaches of Southern France, calmed by blue waves and warm breezes. What you need is an aperitif wine to quench thirst - something light, fruity, and brimming with flavours of fresh ripe grapefruit. Perfect for mingling and seafood salad. Like our Malbec World Day tasting on April 13th, the Terra Andina "Rich" Malbec is in many ways an expression of Argentina's lighter side, filled with energy, openness to new ideas, and socializing. On the nose, red and dark fruits combine with a dash of vanilla. Silk soft on the straight-forward palate, with flavours of raspberry, blueberry, plum. Don't overthink this one, just dive in and enjoy! Since 1789, this family estate has gone through a series of improvements and now the 8th generation is already making their mark. Grapes are from the slopes of Saint Germain de Graves village at the south part of Cadillac. Cherry and strawberry aromas followed by hints of toast. Smooth and round with velvety tannins. Comprised of 80% Merlot and 20% Cabernet Sauvignon. It's not difficult to see why this wine is so popular - it's a terrific value in this price range. We’ve been charging 5 cents for plastic bags and our ultimate goal is to go plastic-free. Bring your own reusable bag when shopping with us, or get one of our Marquis Wine Cellars reusable bags for $2.99 + tax. You can also purchase them online by adding the 4 Bottle or 2 Bottle bag to your next order! Update your contact information using the Update Profile link in the footer of this email (keep scrolling down to the very bottom!) You can choose your wine preferences and update your contact information. This email is part of the main General Wine Alerts mailing list, and there are others you can sign up for.